The new era of Spanish futsal is started. Not only in the 40x20 pitch, with the recent announcement of the new national selections coaches, but also under the management point of view. 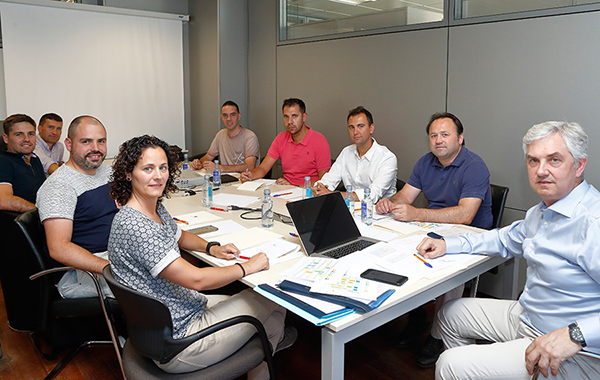 Some days ago a first meeting (photo courtesy: RFEF) of the futsal department was held in the RFEF headquarters, leaded by new sports technical director José Venancio López Hierro. Together with former Spain coach Venancio López his heir on the bench Fede Vidal, new Spain women coach Claudia Pons Xandri, U19 and youth selections head coach Albert Canillas Alavés "Cani". No need of introduction for Javier Orol Sánchez, new secretary of the international department: futsal lover will surely remember about one of the best ever Spanish and worldwide players. Also, Ramón Barreiro Posse (assistant coach and goalkeepers coach in the men selections), David González Piñón (physical trainer of the men selections, you will probably remind him as an active player in many national clubs like Fene Boandanza, Lobelle de Santiago, Azkar Lugo; DKV Zaragoza, Leis Pontevedra, using the club denominations of that time). Last but not least the women selections assistant coach Íñigo Martínez Corchete and Adrián Paz Franco physical trainer and goalkeepers coach in the women selections. Good to remind that, though not attending the mentioned meeting, also a certain Paco Sedano was appointed by RFEF as new general secretary of the Futsal Committee. A first result of the new "team" job arrived on past friday, when all the national teams fixtures were released for the imminent 2018/2019 season. A good resource for fans and media, something that is usually "hidden" by national FAs as a big secret. Transparency and commitment: good times coming for the Spanish futbol sala. P.S. Don't forget to make room for February games... Spain vs Brazil (men selection) is coming!